Book reviews are a complexity when trying to decipher if one wants to believe the reviews in researching whether to buy a book. Recently I received a one-star review on one of my books that usually gets a four or five-star review on Amazon and Goodreads and Barnes and Noble. I read the choice review: This book must be written for 8-year-olds. They would likely get exhausted reading the same sentences over and over again. No real character development at all and Granny is boring. I don’t have a hard time with a low star review if I feel a reviewer is fair. I decided this review probably was fair because I chose to go further and research the person that left this little tidbit. The other books they reviewed were nothing like my cozy mystery. Most were a matter-of-fact or serious crime and mystery books. It was obvious to me that my writing style and choice of the genre were not something this reader would like. They titled the review “Don’t know why I finished this.” Frankly, I didn’t know why they did neither. It differed from a recent five-star review: Granny is a senior citizen who still has a lot of life left in her, and she works undercover for the police, thwarting thieves. She’s a pure dee mess! How anyone could not like this book is beyond me, I’ve bought the series. I really like Granny! 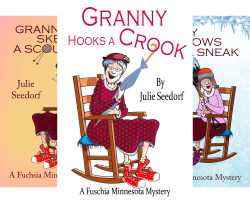 If you look back through this reviewers books you will see that she enjoys the genre of cozy mysteries. So it would make sense she would like Granny. If you are a reader or a consumer that reads the reviews so you can make a choice about a purchase then I would ask you to dig a little further. We as mystery writers are always looking for clues and you can join us in that pursuit when you read reviews. Read more than one review and then check into the history of the reviewer. Are they leaving a review because the subject matter is just not their cup of tea and that is a reason they did or didn’t like it? Or are they leaving a review because they are fairly judging a product on its content and design or workability and not personal prejudice because of their taste? I am not a sports fan. I would not be a good person to leave a review for a sports book no matter how well written. If I were leaving a fair review I would have to state that I am not interested in the subject and that my view was skewered by that fact. If I felt it was poorly written but a good subject I would state that but I would also have to ask myself when I am leaving that review if I was being fair. Perhaps I wasn’t understanding the genre or the language of sports. The kind thing for me to do would be to leave no review at all because I probably could not view it with an unbiased eye. As authors reviews can make or break us. We know we can’t always receive brilliant reviews but we ask our readers to be fair and kind. Authors have feelings too and we do follow our reviews and take into consideration constructive criticism to make our writing better for our readers. We love our readers. I will say this about both my series of books, the Fuchsia Series and The Brilliant Series. The review in the second paragraph states there any character development in the book Because I write with the series in mind my characters develop over the series of books. If you are patient while visiting Fuchsia you will find why Granny is the cantankerous person she is. What happened in her life and what personal hurtful experiences shaped how she acts. You will meet her family and the things that were kept hidden. The same with Jezabelle and the characters from Brilliant Minnesota. What happened in Jezabelle’s youth that she didn’t marry the love of her life? Why is Phoebe rich and ditzy. What about her past is she hiding? Or Mr. Warbler and his secret that no one knows. All this is revealed over the series. They are both filled with humor when addressing those subjects because in life if we don’t laugh during some of our sorrow it would take us under. My characters use humor to traverse life and the mysteries of their communities. When we talk about reviews, what we are really talking about is just a market report – it’s like reading about the new Lexus. You have to know what the guy writing the review cares about to understand his take. Does he like sports cars, or does he like Bentleys?